Business litigation often presents a challenge to a company’s ongoing operations and imperils financial security. Businesses engaged in litigation waste valuable resources, thereby reducing profitability as well as reputation within the community. Addressing issues and concerns and receiving proper counsel at the onset provides for profit maximization and peace of mind. If “the chief business of the American people is business,” then no enterprise should underestimate the importance – indeed, the value – of proper legal counsel. Good, sage legal advice, as well as understanding the best way to observe certain corporate formalities, can, and often does, limit commercial, and sometimes personal, exposure to litigation. That is why we at McGarity and Efstration believe that the best way to deal with business litigation is to establish a relationship with a law firm that will help you avoid it in the first place. We offer informed, experienced advice on corporate structure, formation, contract negotiation, contract disputes, intellectual property, employment disputes, and commercial liability. We are proud to be general counsel for many prominent businesses, of all sizes, and in many different industries, and whether your entity is in need of general counsel or expert advice for a specific issue, our attorneys will offer you the vigorous, knowledgeable representation you and your business deserve. Pre-contract negotiation: We make sure you get the best deal before drafting a contract. When you hire us early in the process, you can save money by avoiding a lawsuit later. Litigation avoidance: We help you avoid lawsuits by establishing the best tools to shield your company from unnecessary liability. We will tell you if you can select a more protected form for your business by incorporating. We can identify the need more for better insurance, and we will help you establish formal policies and procedures and corporate compliance programs. Business counseling: Whether you are in the planning phase of starting a new business, or if you want to make sure your existing business operations are legally sound, we can help. Sometimes business disputes occur no matter how careful you are about avoiding them. If you are being sued, or if you want to file a suit against another business, talk to us before talking to anyone else. We will advise you on how to proceed, from collecting evidence through determining when negotiation would be beneficial. If your case goes to court, we will provide the vigorous representation you need. Despite best laid plans, sometimes litigation is necessary. When that is the case, the trial lawyers at McGarity and Efstration have a vast array of experience in guiding our commercial clients through the mine field that can be commercial litigation. We also have in depth experience with complex arbitration and multi-jurisdictional cases. But regardless of the size or complexity of the case, we always recognize the strains that litigation can cause on an enterprise, whether we are defending or prosecuting any given claim. We therefore strive to make sure that our commercial clients never jeopardize their profitability, their resources or their good public name in the pursuit of justice. We are well aware, after all, that many of our clients see their business as something more than an office building, or a warehouse, or a profit margin. In fact, for many, we know their business is a genuinely intertwined part of their life; perhaps it is their family’s legacy, handed down through the generations; or perhaps their business represents a life-long ambition, a dream to which they’ve staked their name and, sometimes, their last dime; for yet others, their business might well represent the sum total of their life’s accomplishments. The counsel given to these types of enterprises – and to all our commercial clients – should be given with the knowledge that there is always a lot more at stake than the outcome of a lawsuit. The best way to deal with business litigation is to establish a relationship with a law firm that will help you avoid it. At McGarity Group, we will advise you on how to establish sound business practices and draft strong contracts to protect you. If you do face a lawsuit, we will be in the best position to create a strong response within the limited legal timeline. 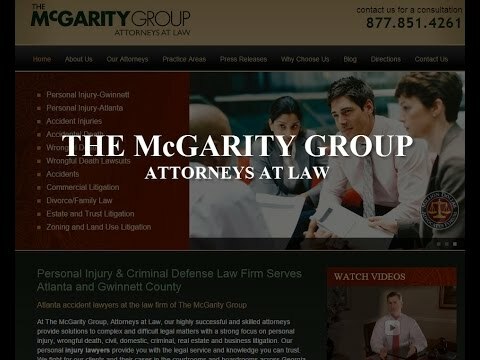 McGarity and Efstration has many years of experience handling, resolving, and trying complex business disputes in state, superior, or federal court. Additionally, we have a vast amount of experience in arbitration and mediation of all types of disputes for our clients. We represent small, mid-size, and large businesses of all types and believe our experience will be well-suited to your business litigation needs. If you have a commercial or business litigation need, let McGarity and Efstration help you when it really matters most. Contact McGarity and Efstration to discuss your business legal needs. Call us today at 877.851.4261 or contact us online.